Who says domestic cats can't learn?Sure tricks can be taught, but more importantly, cats need to learn some practical safety behavior when living with their humans.Cats as with most animals learn especially well with behavior modification techniques.This has been well established by Pavlov's operant conditioning experiments.How does that transpire to the average person trying to get kitty to behave in more desirable manners? It takes patience and consistency, but it can be done.As with most animals, cats learn by repetition and association.The most beneficial way to train a cat is to reward for desired behavior and make undesired behavior unpleasant for them.This does not advocate uses cruel or abusive punishment for undesired behaviors.In fact, doing so will result in the cat learning something entirely different than what is most likely intended-fear.Fear can cause the animal to withdraw, cower, or become aggressive. Rewards do not have to be food or treats.Domestic cats can respond to praise and attention.When owners have the respect of their pets; the pets most often want to please their owners.Giving kitty a scratch behind the ears or a gentle tummy rub may be all she needs.They recognize tones so praising them will be rewarding. 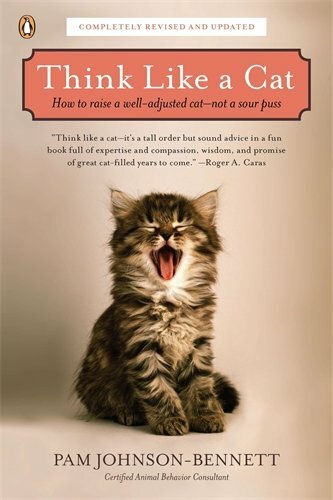 Written by a certified cat behavior consultant, this book is all you need to raise a well-adjusted feline. This book includes tips on how to train a cat and addresses many cat owner concerns. Making the undesired behavior unpleasant for cats can be as simple as making a loud noise; spraying them with water, or believe it or not; grounding them. In working with a cat who loved to jump on the second story balcony ledge; he was taught by his owner to stop jumping on the ledge by being grounded from the balcony. Don’t scoff. This method worked. Here’s how the owner trained her cat Wildthing, who was about four years old at the time, to stay off the balcony ledge. Wildthing was an inside cat. When the owner cleaned the litter box, he was allowed to go out on the balcony for the duration of the process. Wildthing jumped on the ledge giving panic to the owner. The owner in a calm voice but stern tone, told Wildthing to “get down” and ushered him back inside. He was grounded from the balcony for two days. Allowed out after the two days, Wildthing stayed off of the ledge for the next two consecutive ventures out onto the balcony. The third day, he jumped back on the ledge. Again the owner told him to get down, made him go inside and this time grounded him for a week. After the week, Wildthing stayed off the balcony for about six months. He put his front paws upon the ledge and looked over; this was acceptable and he was given praise. When he jumped on the ledge after about six months; the owner used the same process of grounding. It has been over four years and Wildthing has stayed off the balcony. Other training methods available to try include the “clicker” method. This method too, is based on Pavlov’s operant conditioning and was developed and popularized by Karen Pryor. She claims this method works for most animals; including rabbits and canaries. The two main reasons cats are surrendered to shelters is due to undesired behaviors of litter box avoidance and scratching issues. Learning to train a cat properly can result in alleviating these problems. Cats can be trained—of course any cat owner knows cats have to think it’s their idea! The copyright of the article Training Cats to Change Undesired Behaviors is owned by Cheryl Weldon and permission to republish in print or online must be granted by the author in writing. cats are very smart, and I agree can be trained. Great article!